2 Timothy 4:1-5 Preach the Word & Reach the World! 2 Timothy 4:6-22 Come Before Winter! Rosscup - Earlier this was published in The Cambridge Greek Testament (Cambridge: University, 1922). It is one of the finest older works which grapples seriously with the Greek. Bernard was a fine scholar in his day. 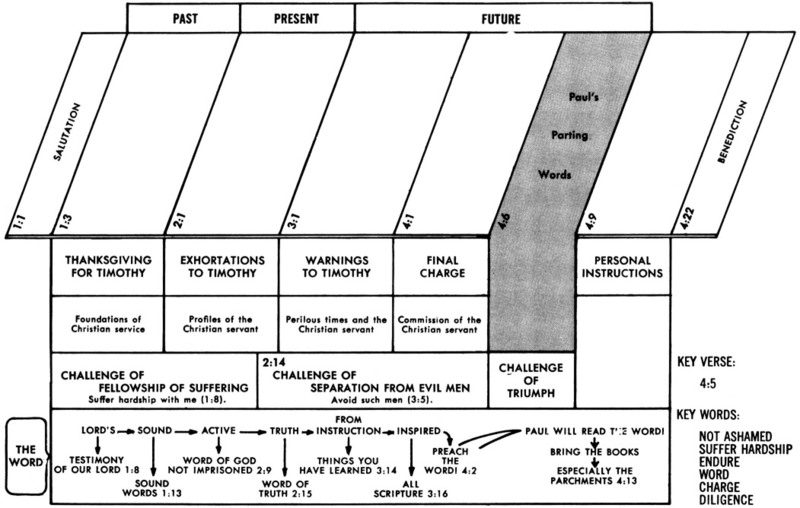 GEORGE CLARKE "Designed for Pastors and Sunday Schools"
2 Timothy 4:2 What does it mean to preach the Word? 2 Timothy 4:5 What does it mean to endure hardship? 2 Timothy 4:3 What does 2 Timothy 4:3 mean by itching ears? 2 Timothy 4:6 What is a drink offering? 2 Timothy 4:7 What did Paul mean when he said he had fought the good fight? 2 Timothy 4:7 What did Paul mean when he said he had finished the race? 2 Timothy 4:7 What did Paul mean when he said he had kept the faith? 2 Timothy 4:10 Who was Demas in the Bible? 2 Timothy 4:11 Who was John Mark in the Bible? 2 Timothy 4:12 Who was Tychicus in the Bible? 2 Timothy 4:14 Who was Alexander the coppersmith in the Bible? H. HARVEY, D.D. Well Done Verse by Verse Commentary. 2 Timothy 4:6- 8:Will You Finish Well? 2 Timothy 4:16-22 Not Alone! 2 Timothy 4:2 Are You A Preacher? 2 Timothy 4:4 Yeah, But . . .
2 Timothy 4:6 What Will Happen? 2 Timothy 4:6: What Will Happen? 2 Timothy 4:6-8 What Are You Living For? 2 Timothy 4:1-5: Preach the Word! 2 Timothy 4:7 The Right Way to Die!